In honor of summer coming to a close and being able to no longer wear white, I am sadly saying "goodbye until next year" to my favorite white skinny jeans. For the FIRST TIME EVER this summer, I could fit into and wear skinny jeans! Boy did that ever put me in a good mood! I lost 2 pant sizes from my weight loss and also had to get a smaller belt size. I was at the mall shopping and thought for the fun of it, lets see if I could fit into skinny jeans. I put them on, without having my thighs get stuck, looked in the mirror and let out a silent scream...THEY FIT! Of course I had to take a picture and purchase them. These quickly became my favorite pant to wear. Not only are they cute and bright, but they match any shirt you throw on! You can wear a sweatshirt with them and still look spiffy! I am also a bargain shopper. Rarely do I purchase something "original" price. I always say, "there is a coupon for everything and anything." 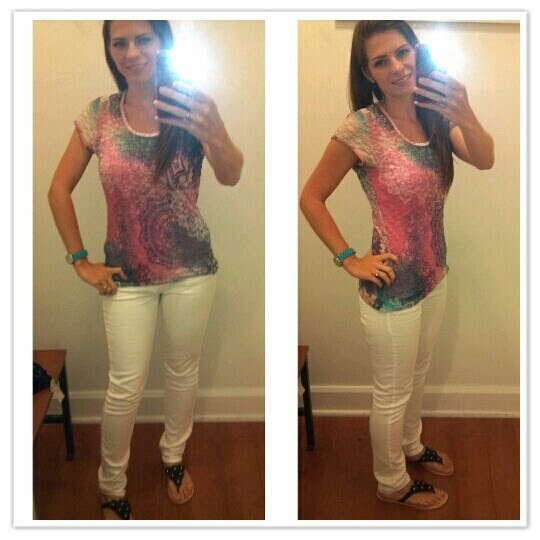 So to find these jeans were on sale for $29.99 (instead of $49.99) I was sold! I posted a couple more summer outfits I had pictures of and the stores I purchased them at. It is sad to see these brights colors go! I loved wearing these shoes! Everyone asked me, "Are those Toms?" I call these my Target Toms! Loved this style of shirt! Great for a dinner date or cooler weather! Here are my white capri pants with my lime green tank and gladiator sandals! So those were some of my summer outfits! I was such a fan of BRIGHT colors this year. Now it is time to give fall a chance (which is another excuse to go shopping) and that means.....even more skinny jeans!